The school’s Astronomy & Space Science Club, named the Sirus Club continuous endeavours to bring the best & the latest in the field of space education to students. By collaborating with SPACE India, the club conducts astronomy classes for students of Grades VI to XII. The very hands-on sessions are conducted after school hours within the campus under the supervision of mentors and are aimed to assist students to enhance their skills in the field of astronomy and star gazing. Through the exposure into various modules, students are made aware of advancements in the field of Astronomy and instils great interest to pursue higher education in fields related to Space Engineering, Astro Physics and the likes. The club members are introduced to a host of topics during sessions. Students are presented with an orientation to the SPACE Astronomy Club, are introduced to Comets and Asteroids, learn to create a Sky Map and work with a DSLR camera and also understand the nuances related to finding cardinal directions, measuring the Earth’s circumference, basics of Rocketry along with the construction and launch of Hydro rockets, to name a few. Club members are given a personal Astronomy Kit that includes a 50 mm telescope and are encouraged to participate in one evening Observation Session and one overnight Observation Session. Students actively participate in Astronomy Day celebrations that give them an opportunity to showcase their learning. Through this exposure, students also participate and fare well in the various competitions and events that are held at a National and International level. SPACE India honours students by awarding them “Amateur Astronomers” certificate upon completion of the program. 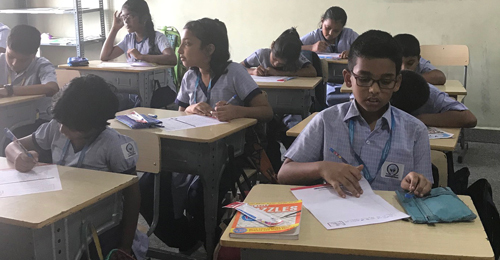 Conducted at the district level at the Omega campus, in association with SPACE, students from different schools were trained how to scout for Asteroids on the basis of available data from eminent observatories in association with NASA. Omega students participated in the 6th International Astronomy & Science Olympiad (NASO) that is organised in 13 countries. Omega’s students from the Sirius Club hosted an observation session at Elliot’s Beach and explained to an audience of over 2000 people about the total lunar eclipse phenomenon. Along with the school teachers, all members of Sirius Club travel to Natwest Mango County at Tiruvallur for an overnight sky observation session. The unique facility has been developed to provide a great sky viewing and research experience to budding astronomers. The site is well equipped for deep sky observation, study and photography. Numerous interactive live facebook sessions by renowned Astro Physicists, Scientists and Astronomers are regularly held at the campus. A group of students learnt how to use the Astrometrica software that assists in successfully searching for Asteroids.